The Papillon is named for its ears which resemble a butterfly – “Papillon” is the French word for “butterfly.” Its origin is considered to be the Continental Toy Spaniel seen in paintings beginning around 1500. There are two types which are based on ear carriage. The erect-eared Papillons resemble the spread wings of the butterfly. 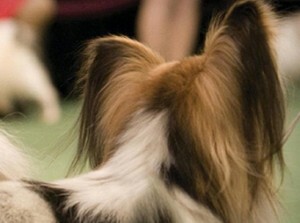 The drop-eared dog is called Pha- lene (pronounced fal?n), or “moth-eared.” At AKC shows, both ear types are shown together, although they are usually separated in the open classes at specialties. In FCI countries, the Phalene is considered a separate breed. We invited fifteen breeder-judges and twenty-four other men- tors to participate in a survey on their breed’s priorities. Twenty- eight said they would, and in the end, twenty surveys were received. The experts average almost twenty-nine years in the breed, and those who judge have been doing so over sixteen years on average. The experts were asked to prioritize a list of virtues taken from the Papillon standard. The list below is in sequence by the average of the rankings, with 1 being the most important. Posted by Alex on Sep 26 2016. Filed under Current Articles, Featured. You can follow any responses to this entry through the RSS 2.0. Both comments and pings are currently closed.